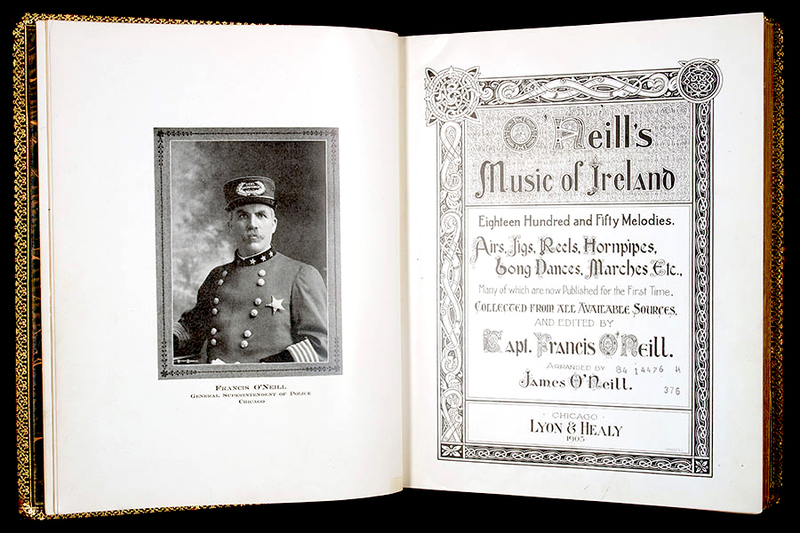 It is hard to say whether Francis O’Neill, the Superintendent of Police of Chicago, is a bard who became a policeman who became a bard. At any rate he is both a scholar and a police officer, and he seems to have possessed the characteristics demanded by these generally supposed widely separated calling from his earliest youth. He has given full swing all his life both to the inclinations that made him a typical police officer and also to his disposition for study and research which made him a scholar. In Chief O’Neill there always have been the two natures which sometimes have worked peacefully side by side and at other times warred furiously. The excitement loving, adventurous, romantic side of his nature, which finally made of Francis O’Neill a policeman. was set off by an intense love of study and reflection and such a remarkable ability of acquiring knowledge that before he was 14 years old he had raced through the Bantry school and been made a teacher. The parents of Francis O’Neill were bothered when he was a child to make up their minds as to whether their boy would be a pirate or a priest. One day he would run away from school and explore all the strange territory surrounding the little lake that lay near the family’s cottage, and that night he would feel the hand of parental wrath and be set down as a wild good for nothing whom nothing could restrain once he got out into the world. But the next day the boy would recite his Latin and Greek so glibly that his teachers would listen to him in amazement and his parents would rejoice that their boy was sure to be a priest. At the beginning of his career, too, Chief O’Neill often stood on the verge of following one of his dual natures to the limit to the entire abandonment of the other. His thirst for travel and adventure made him want to become a sailor and travel. He made all arrangements to ship in a vessel from Sunderland, but while he was waiting for his vessel to be put in readiness, his scholastic and religious nature temporarily obtained the upper hand, and he determined to be a priest, as his teachers at Bantry had intended. So he went to see the Bishop at Cork, who had proposed at Bantry to the boy that he enter the clergy. The Bishop was overjoyed to receive his visitor, and bade him come the next day and be formally enrolled as a candidate for the priesthood and assigned to a college for study and preparation for his life’s work. That night the dual natures in Francis O’Neill had a furious war. Strange lands and far off seas in tropical lands reached out with beckoning hands towards the boy, and at the same time the cloistered walls of the old convent under which he stood called to him to hide himself in their classic shades. When morning came the boy was still undecided. A church bell rang in the distance. It called to him from a convent. He sighed and turned his back on far off lands and sunlit oceans, and slowly walked away towards the Bishop’s house and the church life that lay before him. But somehow he got hopelessly lost in the narrow winding streets of old Cork, and though he walked all day he could not find the Bishop’s house. The next day was too late, for the Bishop had gone away. Then the boy decided that fate had settled the question his warring nature could not, and he hurried down to Sunderland and the shipping and went to sea. For several years he was a sailor, but all this time the scholastic side of his nature was quarreling violently with him, and at last, for the sake of peace and harmony within his own bosom, he quit the sea and began teaching school in Missouri. This quieted the scholastic side of him, but now the other side rose in revolt until O’Neill quit school teaching and came to Chicago and finally secured peace with himself by becoming a policeman (1873) and securing a library. His adventurous, excitement-loving disposition found its outlet in a policeman’s career, and the work he began as a collector of Irish literature and song lulled his bard side of his nature to rest. So, a policeman by day and a bard by night, or vice versa (when he was a patrolman he was on the night shift), Francis O’Neill was gone along for for over twenty-eight years happily enough. One meeting O’Neill on police business and when he wore his uniform and star would believe he was a typical policeman completely absorbed in his profession and with no inclination for dry-as-dust tomes and wearisome research. One meeting O’Neill in his library and listening to him talk of his books or of Irish history would see nothing but the enthusiastic scholar full of the knowledge of the pedant but a stranger in the cold, garish, workaday world outside of library walls. 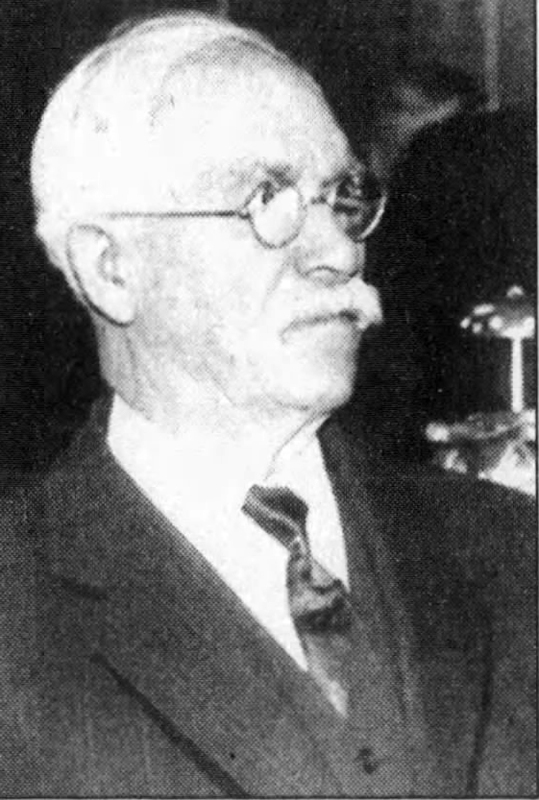 In his office at the City Hall when visited in regard to anything pertaining to police affairs Chief O’Neill is aggressive, short, quick, with a policeman’s bluntness in expressing his opinion. He never feels for words or phrases. He blurts out anything which comes to his tongue just so long as it expresses his simple, honest opinion. He will trifle with no one. No question needs to be argued with him. He rapidly decides in his own mind what is right and what is wrong in every case brought before him and he cannot be moved from his position. As a policeman Chief O’Neill is not a diplomat. He is not skilled in “bending the pregnant hinges of the knee that thrift may follow fawning.” He has ever been a thorn in the sides of the bosses whose shadows lay black across the floors of police stations. The bosses were set at defiance when O’Neill would snap his finger under their noses. So the natural result was that O’Neill wandered about from one police station to another, a sort of modern pariah with his hand against every precinct boss and unmade things things like police captain that he once whaled an Alderman, a political joss, and sent him to the police station in a patrol wagon. Of course he was transferred for this act, but he did not care. He would have done it again the next day with pleasure. This is O’Neill, the policeman. 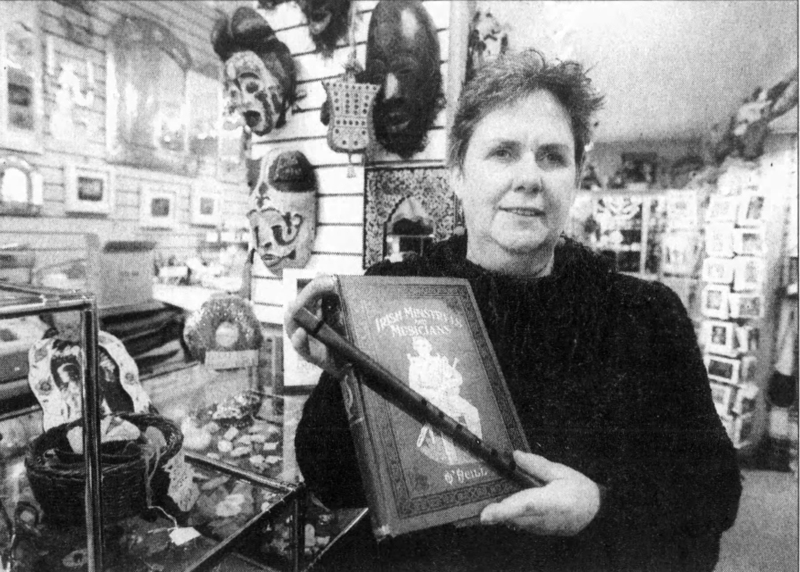 Go to his house at 5448 Drexel boulevard any night, and O’Neill, the scholar and bibliophile, may be encountered. In his library are 1,500 volumes of rare works, first editions and curios. One division of his library is devoted to histories of Ireland by every author who ever entered that field. In the collection are books three and four centuries old that were picked up by Chief O’Neill after years of patient search among the old book shops of a dozen different cities. Chief O’Neill’s reputation as a bibliophile and antiquarian has won him a membership in the Cork Historical and Archaeological society and he is famed on both sides of the Atlantic as an authority in all matters pertaining to Irish history and tradition. 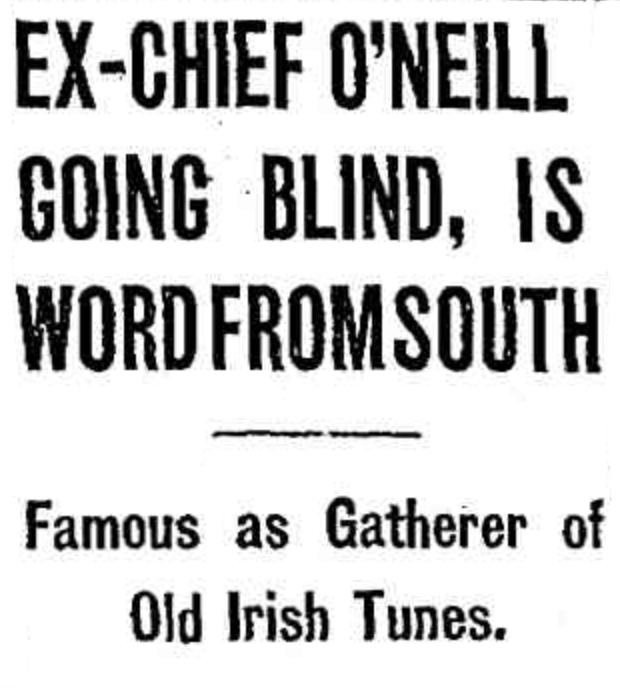 Chief O’Neill is the custodian of the richest treasury of Irish music in the world. Through his zealous efforts, covering a period of over a dozen years, 1,500 Irish airs hitherto preserved only through traditions have been rescued from oblivion and written down that they might endure as a precious heritage for the sons and daughters of Erin. In his library Chief O’Neill becomes the scholar and pedant. He loses the quickness and abruptness that characterize him in the City Hall. He speaks slowly and frequently, holds his words until he has looked through some of his ancient volumes to be sure of his position. His memory is marvelous, and he has a thousands of old facts and traditions at his tongues end. Chief O’Neil is now 53 years old. He was born in Tralibane, three miles from Bantry, County of Cork, Ireland. In 1865 he shipped as a sailor from Sunderland and visited Odessa and Russia. Then he made a voyage to New York, and from there he shipped before the mast to Japan, and on the return voyage was shipwrecked, and after a few weeks on a desert island in the South Pacific was picked up by a passing vessel and carried to San Francisco. In 1871 he came to Chicago and became a laborer in the Chicago and Alton yards. In 1873 he became a patrolman under Commissioner Elmer Washburn, and a month after he had donned his star was sent to the hospital with a bullet in his breast fired by a tough whom he had placed under arrest. In 1878 he was a desk sergeant at the Deering Street Station, and three years later was a Lieutenant and confidential secretary to the Superintendent of Police. In 1870 Chief O’Neill married Miss Anna Rogers of Bloomington (Illinois), whom he had met when she was a passenger and he a sailor on the Emerald Island, the ship which brought him to New York on his first trip to this country. Five children have been born to Mr. and Mrs. O’Neill; Mrs. Julia Mooney, the wife of Patrol Sergeant James Mooney; Caroline, a teacher in the Chicago schools; Roger, May, and Anna, all in school. 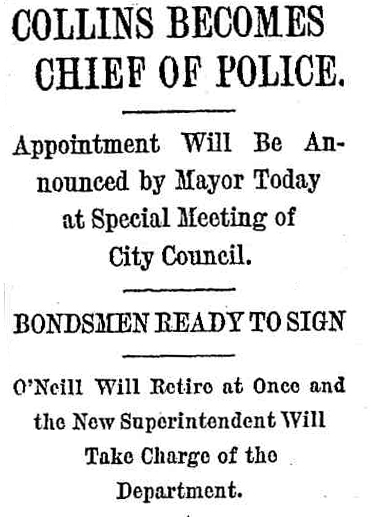 Francis O’Neill was re-appointed to a new term as General Superintendent of the Chicago Police on June 25, 1905. It didn’t last long. 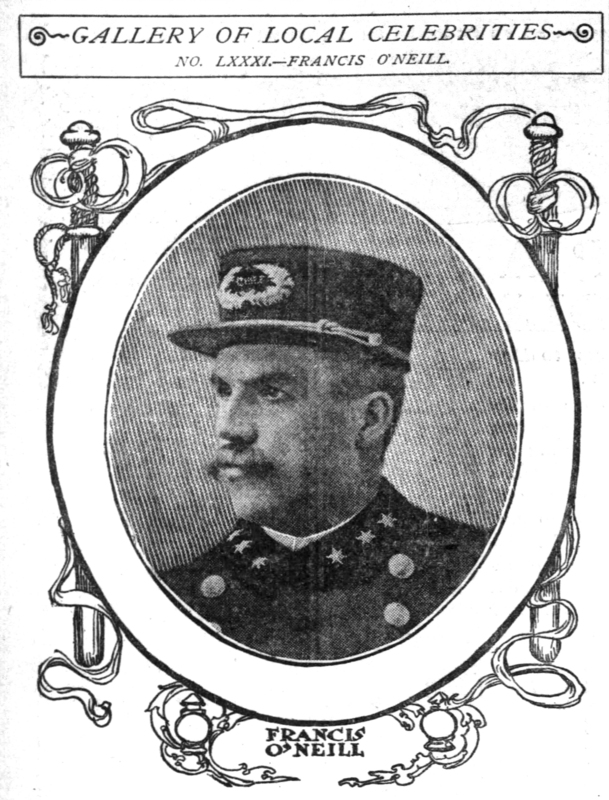 John M. Collins, author of the popular romance, “Mike Smith, or the Adventures of the Phantom Ship.” will succeed Francis O’Neill, author of “Songs of Ireland,” today as general superintendent of the Chicago police force. The appointment was yesterday morning by Mayor Dunne, though announcement of it was withheld, and in the afternoon the formal papers making the selection were drawn up and signed In the mayor’s office. A special meeting of the city council has been convened for 10 o’clock this morning for the purpose of receiving the appointment at the hands of the mayor. The appointment will be confirmed and Capt. Collins will at once furnish the bonds and take the desk. Then Chlef O’Neil will be free to pack his trunks for his eastern trip and to plan fall work for his arm at Pales. Mayor Admits Choice Is Made. I have selected the man for the place. It will not be made known until .morning When he takes office he will enforce the laws. O’Neill Has Little to Say. The retiring chief spent the day in winding up his affairs. He was not in an amiable mood, and refused to become ” reminiscent,” as his friends, who flocked to his office, wished. He would not discuss the respective merits of the men mentioned for his office.,and professed to have no information as to the identity of his successor. The chief to be is famous for two things, either of which, according to precedent would fit him for the office to be upon him. One Is the immortalizing of Patrolman Mike Smith, while Collins was detailed at the Rogers Park station, and, the other is Collins’ own record. as a police officer. The combination of the two has turned the balance in his favor. The outgoing chief, in addition to his lyrical talents, plays the flute, and his penchant for Irish minstrelcy he will be able to cultivate to its fullest extent as a farmer. Capt.Collins smokes his “dream pipe.” There never was a man on the police force who broke the pencils of so many “cub” reporters trying to get down the weird tales he gave them as this well educated Irish-American, John Collins. Former Chief of Police Francis O’Neil writes from Ocean Springs, Miss., to an old Chicago friend that he is fast losing his eyesight. One eye is totally blind, he says, and the other is dimming. It is only a question of time when he will no longer be able to see the sunlight. The unwelcome news was told by the friend who received the letter to several of Capt. o’Neil’s old cronies, and messages expressing sympathy for him in his affliction were yesterday dispatched to Mississippi. 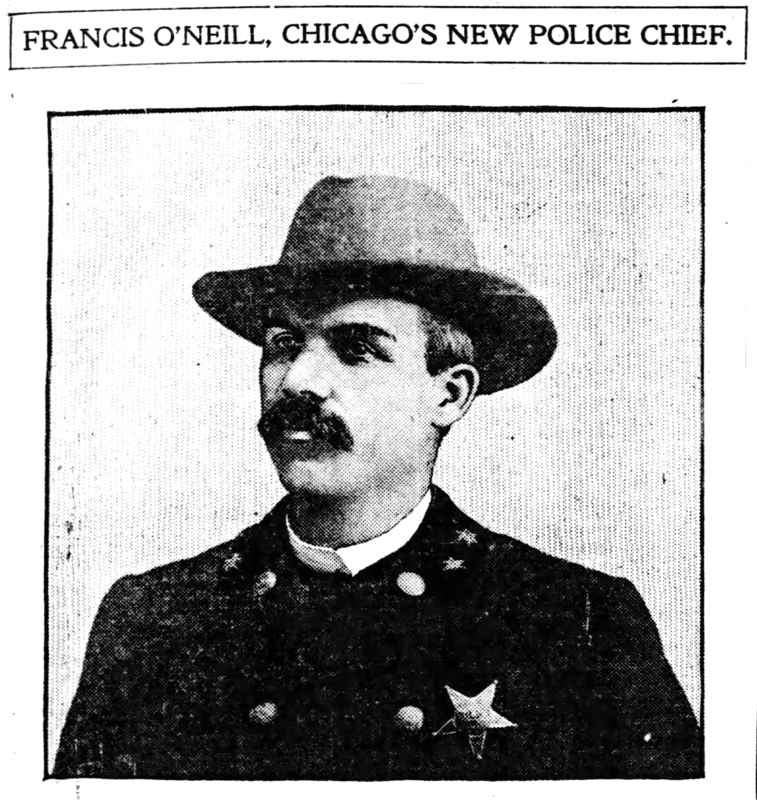 Captain O’Neill, by which name he prefers to be called, was a member of the Chicago police department about 32 years. He joined the force in 1873 and rose through every rank to captain. Mayor Carter H. Harrison appointed him superintendent of police in April, 1891, and he served until August, 1905. Mayor Harrison was was succeeded in 1905, by Mayor Dunne, but the latter kept Chief O’Neill on account of a teamsters’ strike that was in progress when he took office. At the conclusion of the strike, Chief O’Neil asked to be relieved of his task, and his registration was accepted. He served longer as head of the department of the police department than any other chief. Himself as a performer of no mean merit on the flute and violin, Capt. O’Neill was particularly fitted for the self-imposed task of rescuing old Irish airs from oblivion. He compiled four or five books of these old reels, jigs and airs, and they were given a favorable reception, especially in the music centers of his native land. 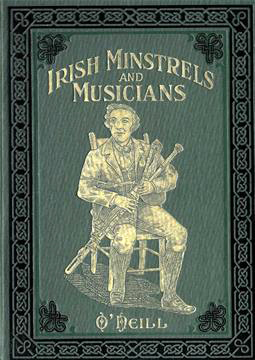 The last book of this nature, issued last Christmas time, was “Waifs and Strays of Irish Melody.” In this work he showed that such tunes as the “Arkansaw Traveler” and “Turkey in the Straw” were played by the fiddlers and pipers of Ireland many years before they were heard in America. Reporters who saw the chief leaving his office hurriedly figured that he was going out on a hot tip concerning the murder case. All the evening papers gave this story a “scream” head. Upon his return to the office he was besieged by the reporters. Capt. O’Neill was born in County Cork, Ireland. He is 75 years old. His Chicago home is at 5448 Drexel avenue. 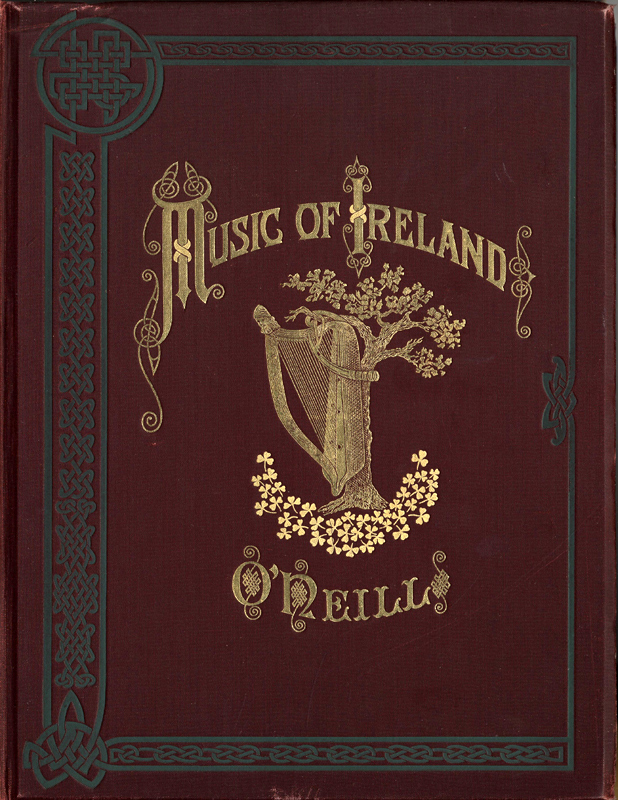 Mary Lesch, Francis O’Neill’s great granddaughter, holds an Irish flute and one O’Neill’s six volumes of Irish folk music. “What he did is so important… Music is truly the art of the Irish people,” Lesch said. 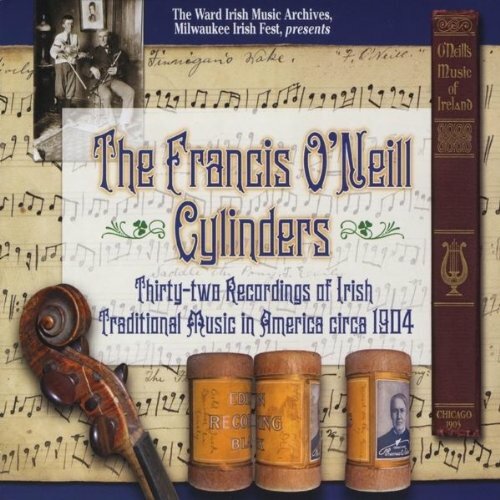 Captain O’Neill was recorded on cylinders playing his flute and violin . This collection is available through iTunes.